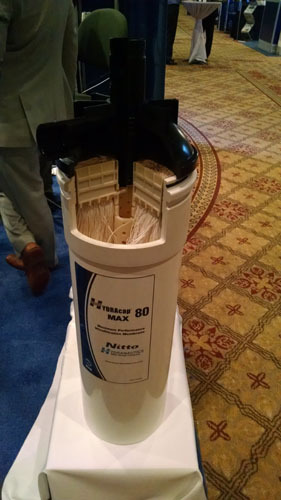 The American Membrane Technology Association (AMTA) and the American Water Works Association (AWWA) joined forces once again, March 2 to 6 in Orlando, FL, to host America’s premier conference dedicated solely to membrane-related technologies. 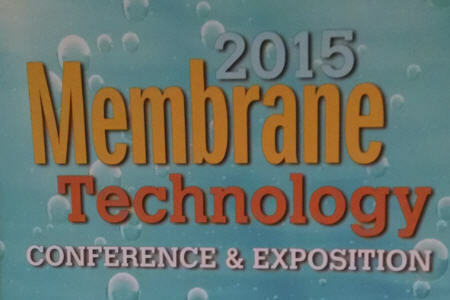 While that description may seem limiting, the Membrane Technology Conference (MTC) is quite the contrary; in fact, it is notable for its variety. Membranes do it all — drinking water, wastewater, desalination, reuse, industrial process water, produced water, etc. — and MTC reflects that scope. 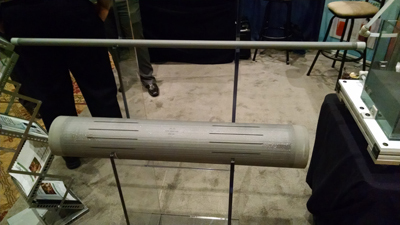 Currently there are about 2,000 membrane facilities in the U.S., according to AMTA, but installations are destined to rise in coming years to combat water scarcity (via reuse and desalination) and ever-stricter regulatory requirements. Continued technological advancements will also be critical in propelling the membrane movement forward, with the following 10 technologies among those paving the way. While membranes are looked upon for the highest level of contaminant removal, the persistent issue of fouling causes headaches among operators and presents a challenge to manufacturers — to build a membrane that resists colloidal/particulate and biological fouling. Hydranautics’ LD (low differential) line of reverse osmosis/nanofiltration (RO/NF) elements utilize thick, 34-millimeter feed spacers to reduce particulate buildup in the spacer mesh, which also reduces hydraulic pressure losses and energy requirements. Additionally, the spacers are chemically treated with a patent-pending formula called HYDRAblock to reduce biofouling. Although larger-than-conventional spacers typically mean less available membrane surface area for treatment, innovative manufacturing techniques have enabled Hydranautics to maintain the full 400 sq. ft. of active surface area in their 8” RO elements. Membrane bioreactors (MBRs) combine biological wastewater treatment with membrane separation — a true space-saver and increasingly popular alternative to conventional secondary (activated sludge) treatment processes. Even MBR has its conventions, however, with most requiring air scouring via a blower to keep fouling under control. 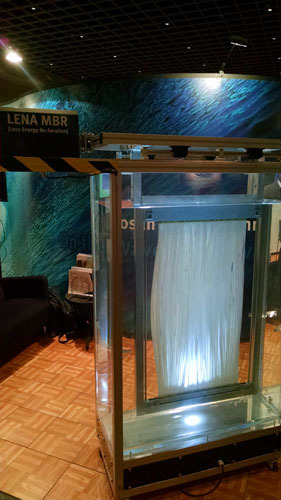 The LENA MBR, on the other hand, does not require air scouring or a blower; instead, it prevents sludge accumulation by employing a “membrane reciprocating system” attached to the membrane cassette. Inertia force keeps the submerged hollow-fiber membranes clean, as opposed to energy-intensive air scouring. In pilot studies, the LENA (“low energy, no aeration”) MBR demonstrated energy savings of approximately 75 percent compared to conventional MBR treatment. 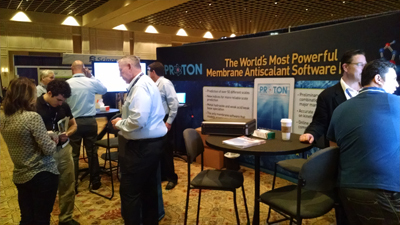 Membrane modeling software appeared as a trend at MTC, with a number of vendors announcing tools to design and care for membrane systems. Dow Water & Process Solutions stakes its claim with a comprehensive solution called the Water Application Value Engine (WAVE). Dow’s aim is to make membrane design more convenient for engineers by integrating modeling capabilities for ultrafiltration (UF), RO, and ion exchange (IX) into a single program, rather than three separate ones. It’s also hosted in the cloud for access anytime, anywhere. Beyond just convenient, its functionality increases the accuracy of system projections/requirements, thus saving time and money. WAVE will be available later this year, upon completing its current round of beta testing among real-world customers. Here’s a sneak-peek screenshot of the user-friendly platform, which was previewed with live demonstrations at MTC. 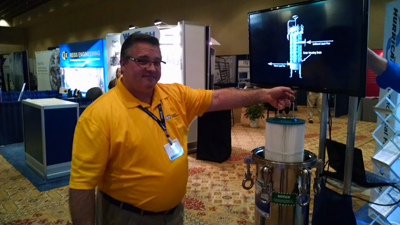 Alkema launched a more focused software product at the show, designed specifically for chemical cleanings. The PROTON Membrane Aqueous Chemistry Calculator determines the accurate antiscalant dosage for over 50 different scale types, preventing overdosage and promoting cost-savings in the process. According to the company, it’s the only antiscalant software to account for concentration polarization, and the only software that models arsenic rejection in RO and NF membranes. It also predicts permeate quality and can provide speciation calculations to optimize pH for better contaminant rejection or coagulation. 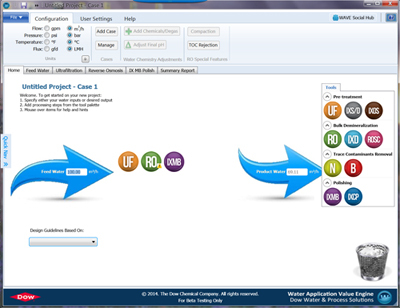 PROTON’s kinetics-based scale prediction works with any type of water, at any pH and temperature, and can be accessed on computers, tablets, or smartphones. FiberMove proves that innovation doesn’t have to be highly technical, offering a simply engineered solution for the sometimes arduous task of moving membranes around the plant. 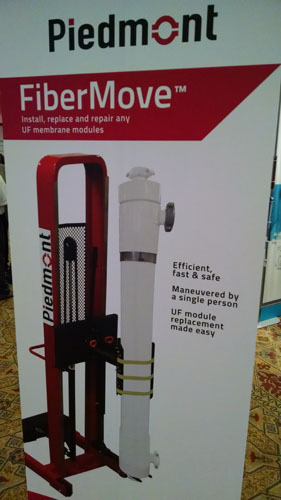 The brainchild of Piedmont, a subsidiary of H2O Innovation Inc., FiberMove enables fast and safe transport of membrane modules, which can weigh as much as 120 lbs. dry and 200 lbs. when full. While motorized and computerized transporters are available (for much more money), this model is intentionally designed without bells and whistles — though it does have everything you need to maneuver an 80-inch membrane module in and out of a rack with ease. It features a built-in hydraulic system to raise and lower the module, a telescopic arm, horizontal and vertical rotation, and numerous safety features that comply with industrial environmental, health, and safety (EHS) guidelines. Membrane manufacturers are constantly battling to differentiate themselves and their products, but Scinor has already done so by inventing and patenting thermally induced phase separation, or TIPS. Developed in China and backed by 15 years of R&D, TIPS is a process for manufacturing hollow-fiber PVDF ultrafiltration membranes that reportedly have a higher tensile strength and flux rate than those made by the predominant method of non-solvent induced phase separation (NIPS). 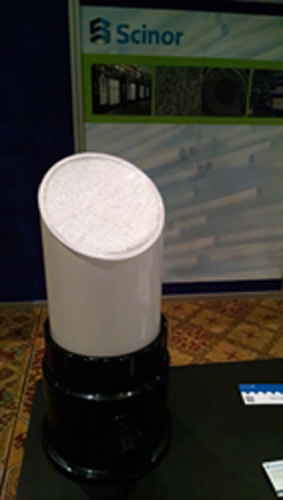 TIPS membranes have over 100 installations worldwide, initially popularized in Asia, but they’re now becoming more visible and accessible in North America with the formation of Scinor Water America in 2014. Traditionally, the most effective means of protecting membranes has been with prefiltration of feed water. HARMSCO offers filter housings for RO/UF pretreatment featuring a patented upflow design that promotes cyclonic separation and eliminates dirty bypass. The housings are available in a variety of sizes, all constructed of 304 stainless steel on the outside with a CPVC standpipe (stainless steel optional) inside. In addition to providing high-flow capability and fewer filter change-outs, the filters are extremely rugged — cleanable and reusable, and rated for pressures to 125 psi and temperatures to 140°F (60°C). The performance of the filters is such that they can even replace RO in drinking water applications, satisfying Long Term 2 Enhanced Surface Water Treatment Rule (LT2) standards for the removal of Cryptosporidium as well as Giardia. For certain, one of the major drawbacks of membrane filtration is breakage, but what if there was a membrane fiber that was unbreakable? 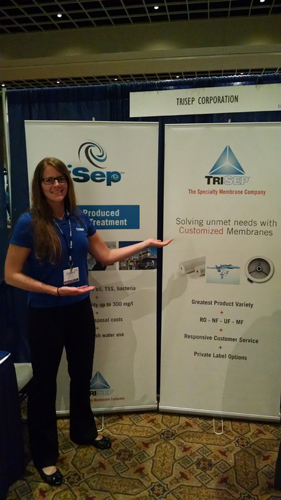 TriSep Corporation boldly states that its iSep UF membranes eliminate fiber breakage and membrane plugging, thereby cutting or eliminating O&M and pretreatment costs associated with those issues. The vacuum-operated, spiral-wound UF modules are equipped with 0.03-micron PVDF membranes that are hydrophilic and oleophobic, making them ideal for oil and gas/fracking operations. The membranes can handle feed water with oil and grease concentrations as high as 300 mg/L, total suspended solids (TSS) up to 1,000 mg/L, and turbidity measuring 1,000 NTU, giving treatment results of <1.0 mg/L oil and grease, <1.0 mg/L TSS, and <0.1 NTU. The hardy nature of the membranes also allow for aggressive cleaning, so irreversible fouling is all but eliminated. For especially demanding applications, ceramic membranes have certain advantages over their polymer counterparts. LiqTech goes further by claiming that their SiC ceramic membranes outperform conventional (A1203) ceramic in terms of life expectancy, flux, chemical resistance, energy savings, fouling, and temperature resistance. The membranes are available in tubular or flat-sheet configuration, and in nominal pore sizes down to 0.04 micron. According to the company, SiC liquid membranes provide the highest flux of any membrane material, are chemically inert (handling pH from 0 to 14), and are thermally resistant up to 1400°F (800°C). While they are particularly suited for challenging industrial environments, SiC membranes can be used virtually anywhere polymers would. A new membrane-aerated biolfilm reactor (MABR) system was introduced via a technical session at MTC, reportedly capable of reducing energy for aeration by 400 percent versus bubble aeration, while also increasing treatment capacity by 25 percent. According to GE’s Jeff Peeters, MABR has been around as a concept since the 1960s, but the soon-to-be-launched ZeeLung product finally makes it commercially viable. It utilizes hollow-fiber, thin-diameter membranes to perform simultaneous chemical oxygen demand (COD) removal, nitrification, and denitrification. 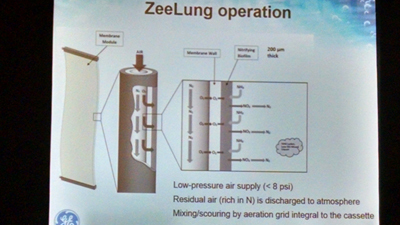 ZeeLung features a high specific surface area and low surface loading rates, allowing the system to maintain thin biofilms (~300 μm) that require only low air pressure. Which of the above do you think has the most potential? Share your thoughts on these or other new and impressive membrane technologies in the comments section below.